Another Studio’s workspace is located in the apartment building in Lubotran St., also designed by the studio. Initially planned as an apartment of 120 sq.m, the space has undergone a transformation into an open-plan studio by demolition of almost all non-load-bearing walls. Open libraries, glazing, a sliding door and white curtains are the elements defining, but not separating the different areas, all of which have a visual connection. 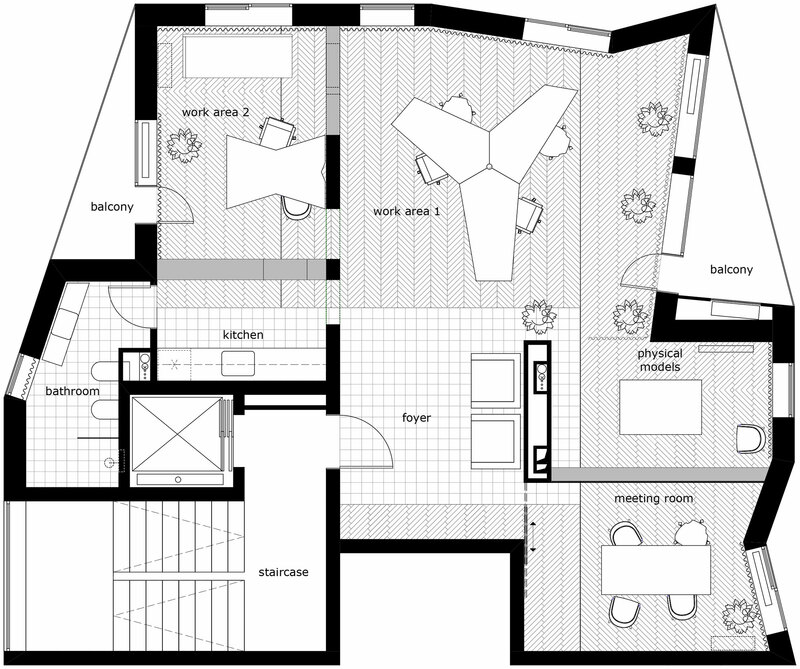 The space accommodates 2 work areas with 7-8 positions, a corner for physical models, a meeting room, a small kitchen, a bathroom and 2 terraces. The flooring combines oak parquet arranged in different patterns with ceramic tiles in the kitchen and bathroom area. Pine plywood and black painted metal are used for the furniture and white cotton-rich fabric for the curtains. The library between the physical models area and the meeting room contains elements which can be taken out and used as side tables and chairs when needed. The two other libraries are used from both sides. The one separating the kitchen area from the work area has a built-in clothes rack. The large central desk is of island type and is composed of 3 modules, assembled together in the shape of the letter Y. Its size, shape and position allow for the comfortable work of a team of 5-6 people.